Ever since the publication of the Steam Greenlight Trailer, many people have asked for details on gameplay – especially how the machines are built, and how they are driven within the game. So, here is a new video with all the answers! As you can see, the approach MechoEcho takes on construction blocks is fairly fundamental. We’re not going to provide you with robotic arms; we’ll provide the kind of engines and light-weight blocks that allow you to build robotic arms on your own. We think it’s more creative if you build your own stuff, and it makes the puzzles more interesting and fun. This should also result in some wildly unusual creations from all of you. At least, we hope so. We don’t want to make it frustrating to figure out so the blocks and user interface are really easy to use. That way, you can focus on solving a puzzle instead of getting lost in the details. Our goal is: Complex machines with simple tools! 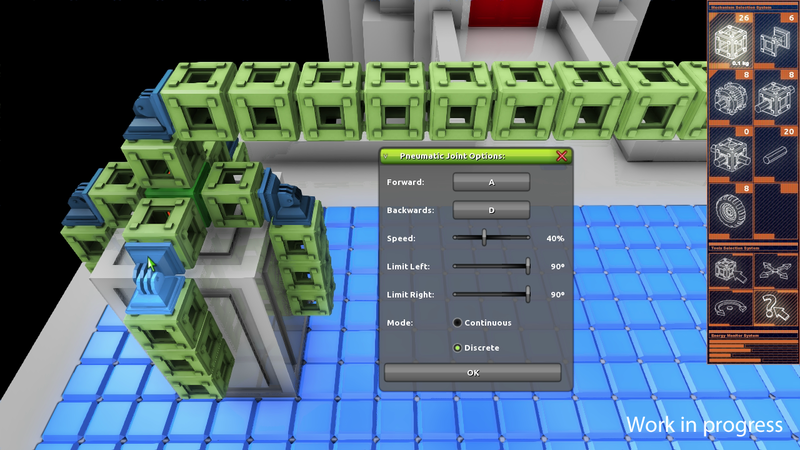 Every block with movable parts can be configured with the Configuration tool. You’ll want to choose which keys on your keyboard will activate each block. Most likely, you’ll also want to tweak other settings – sometimes you’ll want a very fast vehicle, other times precision will be more important. The pneumatic engines seen in the image below can be used to create robotic arms and hands when moving slowly and precisely, but they can also function within a jumping machine by having them run at full speed. MechoEcho is not just about building cool machines – driving them must be fun and challenging too! You have to get over obstacles, sometimes while being chased, so you have to be able to precisely maneuver the machine you built to overcome the obstacle and solve the puzzle. The game features moving and rotating platforms, as well as triggers that need to be activated in specialized ways, sometimes in humanoid form and sometimes in machine form. This adds more complexity to the puzzles and makes the game more challenging and dynamic. The available set and number of blocks varies by level, and by difficulty setting. 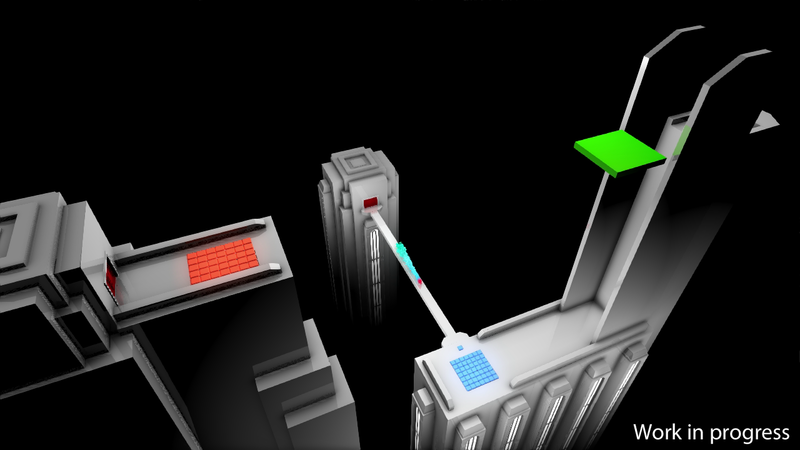 Most of the levels, will offer a Difficult mode counterpart that will be unlocked once the level has been solved. For example, the first level in the video shows a drawbridge activated by a button. While the easiest way to solve the puzzle is to ignore the button and build a vehicle fast enough to land on the other side, in Difficult mode you’ll have no wheels available. Suddenly, the puzzle becomes very different. Instead of building a fast vehicle, you may have to build a walking or jumping machine that won’t step on the button, and thus not trigger the drawbridge. This video only demonstrates the basics of creating and driving your machines within the game. We haven’t discussed the added dimension that the legend storyline will bring. For that, you’ll have to wait for a later video. Stay tuned!